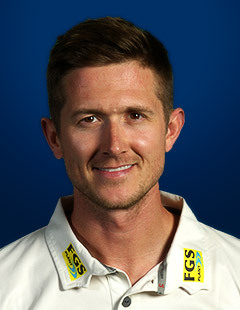 Joe Denly was the first Canterbury-born cricketer to be capped by the club in 2008. The right-hander is widely regarded as one of the most attractive strokemakers on the county circuit. In the shorter form of the game he attacks from the outset, making the most of the powerplay overs and in championship cricket he has the ability to bat through an innings. Denly spent three seasons at Middlesex before returning to the club in 2015. He improved his career-best score in 2016 with a double-hundred against Northamptonshire and bettered it again with 227 at Worcester in the following season. 2017 was a golden year for Denly: he scored more than 1,800 runs in all formats and was the top scorer in the NatWest T20 Blast. Denly played a part in three club records: sharing a club record of 382 with Sean Dickson in the Championship before hitting the top individual T20 score of 127 at Chelmsford in a world record T20 opening stand of 207 with Daniel Bell-Drummond. His exploits earned him the 2017 Spitfire Player and Batsman of the Year awards. In 2018, Denly became the first player to ever score a century and take a hat-trick in the same T20 fixture, away at Surrey in the Vitality Blast. The end of the 2018 saw Denly scoop up the PCA’s Vitality Blast and Royal London One Day Cup Most Valuable Player Awards, as well as the overall 2018 County MVP Award. His form in 2018 earned him a maiden England Test call-up that winter, becoming to first player born in Canterbury to play a Test for England. Denly was award a Testimonial Year for 2019.